TRAI directs Telecom Operators to provide Web Based Complaint Monitoring System to users! Every service provider shall, within forty-five days of coming into force of these regulations, establish a ‘Web Based Complaint Monitoring System’ to enable the consumers to monitor the status of their complaints. The directive also stated that Telecom Operators will have to widely publicize this in media so that consumers are aware about it. I am sure majority of telecom customers have faced this issue where they have lodged a complaint with their Telecom provider and subsequently no action has been taken. The worst part is calling the call center, which in itself is such a big pain that consumer chooses to ignore rather than spend precious time pursuing the outcome of complaint made. The directive by TRAI released yesterday not only talks about the web based complaint monitoring system, but also about various other aspects on resources & infrastructure that a telecom Customer Service center should have. It is good to see that TRAI is taking several measures to ensure good Quality of Service provided by telecom service providers to its customers. TRAI also has given a timeline of 45 days for everything to be implemented by these telecom operators! The new process replaces the old 3 tier mechanism, where Call Centre, Nodal Centre and Appellate Authority we involved. In new process Nodal office is done away with – and If a consumer is not satisfied with the redressal of his complaint, he can directly approach the next tier – the Appellate Authority for redressal of his complaints. The only issue in the new process which may again be counter productive is that Telecom Operator themselves have to appoint the Appellate Authority, who may probably be biased towards the operator. 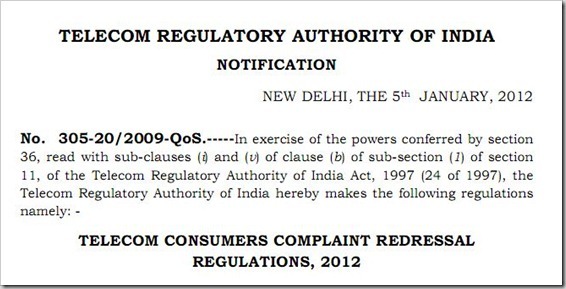 Read the entire TRAI directive here and let us know what you feel about it!